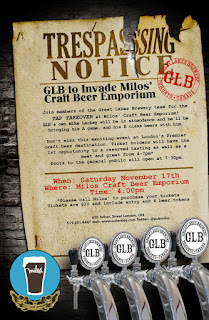 Milos Kral of Milos' Craft Beer Emporium is not one to stand around a wait for things to happen. Before opening his own beer mecca, he was the former manager of London's Gambrinus Bistro. There, he was able to bring the forest city a selection of craft beer like no other. He arranged for meet and greets with almost all of the Ontario Craft Brewers, brought in legends like James Watt of BrewDog from Scotland, he even hosted one of London's most successful beer inspired events ever with a tap takeover from Flying Monkeys Craft Brewery (check out the time-laps of the event from your very own Beer Geeks here) . Well Londoners, you are in for another treat! 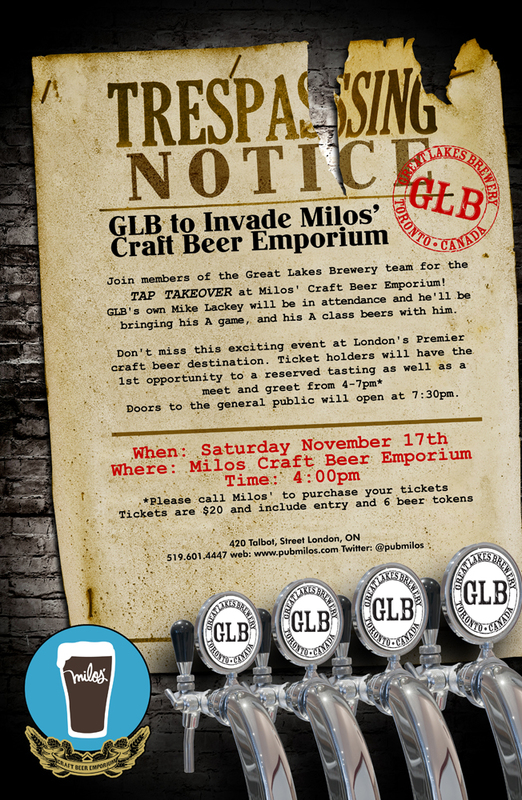 Teamed up with Toronto's Great Lakes Brewery and the beer genius that is Adil Ahmad, a GLB total tap takeover is headed to Milos' Craft Beer Emporium on November 17th, 2012. I for one will be looking forward to seeing what the total of 23 one-offs have in store! The evening will consist of two parts. First, a ticketed event from 4:00 pm to 7:00 pm with a cost of $20.00 which includes six tokens plus guaranteed access to all of the beers and a chance to chat with brew master Mike Lackey. Then doors will open to the general public at 7:30 pm. While there will be a lot of beers available, they cannot guarantee that all of them will make it to the general public portion of the evening. As always, space is limited. Get there early and bring cash to aid in speedy service. You can get your event tickets at the bar. Cash only. Out of town people can call Milos directly at 519.601.4447 to inquire about purchasing. Give the Gift of Craft Beer this Holiday Season! Cannery Brewing’s Lakeboat Lager Sets Sail!